Bulk loose leaf tea is certainly at the starting gate here in the U.S. for home consumption, and many people have stopped in and asked some really great questions. Store your tea in an airtight container, away from heat, cold, light and moisture. Also, keep your teas away from other strong-scented items, which can be absorbed by fine teas. Don’t store your tea above your microwave or oven, in your garage, or in your refrigerator. How long can I keep my loose tea leaves? If you properly store your tea, it will never turn bad. However, the tea will turn “stale” over the course of time. Generally, you should clear out your tea cabinets in anywhere from six months to one year. Typically, larger leaf (think Pai Mu Tan), and more tightly rolled (think gunpowder) teas stay fresher longer. How much tea do I use? How long do I steep my tea? What temperature water do I use? When we sell our loose-leaf teas to our customers, we provide them with all of the instructions they will need to steep the perfect cup of tea. As a guide, here’s a great chart for your use. Does green tea have half the caffeine of black tea? I had the pleasure of attending World Tea East in 2012 in Philadelphia and attended a discussion hosted by Kevin Gascoyne, author of Tea: History, Terroirs, Varieties. I encourage serious tea folk to pick up this book. It’s widely (falsely) believed that green tea has less caffeine than black tea. Kevin has published results from his experiments which proves this false. Although Camellia sinensis overall has, generally, half the caffeine of coffee, there cannot be a blanket statement to this fact. In fact, seasonal differences account for massive differences in caffeine content as well. Camellia sinensis will have more caffeine concentrated in the new growth. Kevin Gascoyne, at the 2012 World Tea Expo showed a 300% increase in caffeine between two pickings at different times of year in the same plantation. Can I decaffeinate tea by steeping it twice? No. 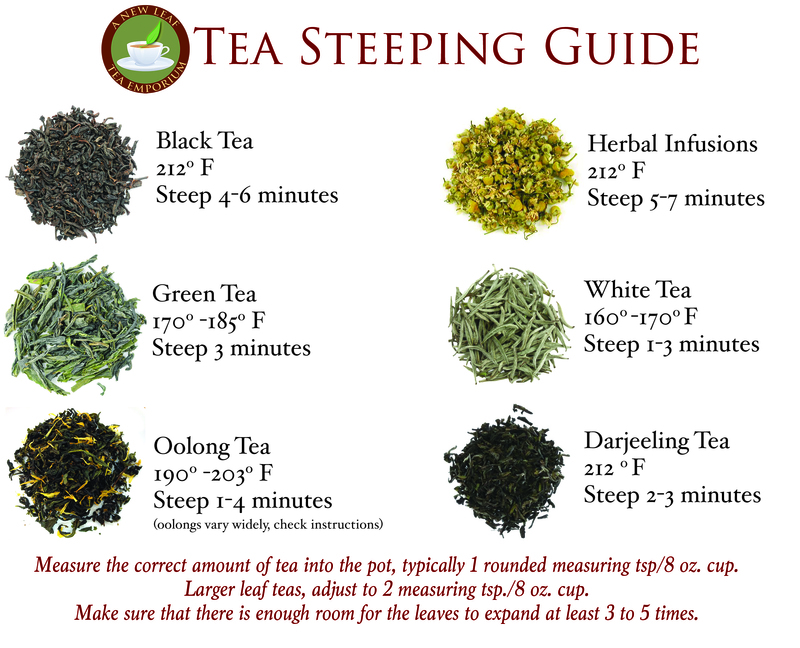 If you follow Tea With Gary, he shows that by steeping tea leaves for three minutes, you can remove about 42% of the caffeine in each cup (34 mg per cup). Steep leaves for two minutes, the extraction level drops to about 33% (total of 106 mg). A second infusion removes approximately 63% of the caffeine, but using a total of half as many leaves (total of 101 mg). It was unfortunate to hear this morning that Garden City’s Belmont Festival on Seventh Street (where A New Leaf has its brick and mortar home) was postponed until Friday, June 28 due to the remnants of TS Andrea. 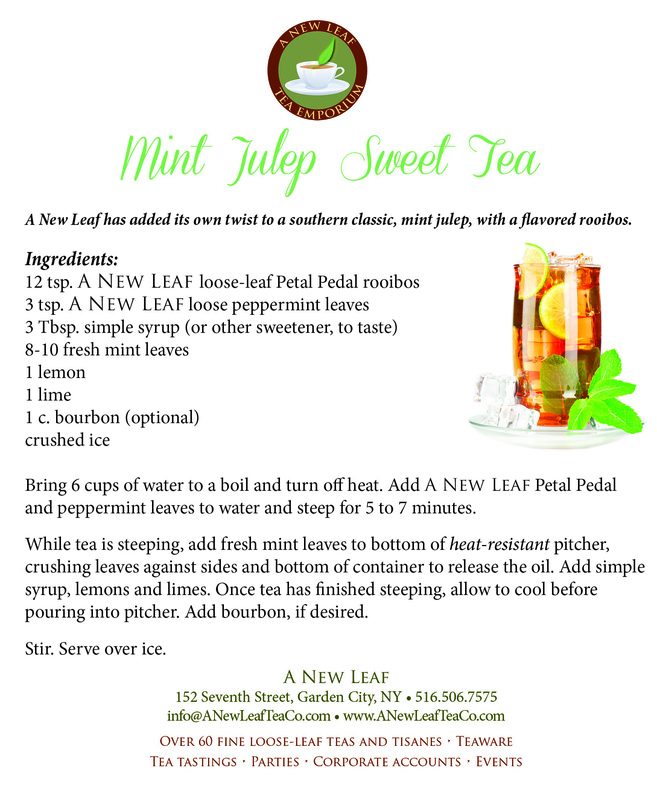 However, with the running of the Belmont Stakes tomorrow in nearby Elmont, A New Leaf is happy to share its unique Mint Julep Sweet Tea recipe with the community. The mint julep is typically associated with the running of the Kentucky Derby, and has been since 1938. Each year almost 120,000 juleps are served at Churchill Downs over the two-day period of the Kentucky Oaks and the Kentucky Derby. A New Leaf has taken a classic drink and given it a new look. A high-quality rooibos and organic mint leaves steeped to perfection provide a great base to our very own recipe. We’ll be promoting our Mint Julep Sweet Tea all weekend long (June 7 through 9) and providing free samples.